An entire food truck selling grilled cheese? Bless you, Los Angeles. 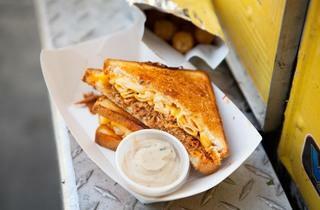 The Grilled Cheese Truck makes daily stops around the city, slinging cheesy concoctions from its four-wheeled abode. You can get a plain grilled cheese sandwich (with cheddar, jack, brie and other cheeses), but that's just a starting point. The goat cheese melt features sun-dried tomato whipped goat cheese, caramelized mushrooms, fresh arugula and balsamic syrup; the French onion soup melt is like a soup-and-sandwich in one, with onion soup compote and a parmesan crust. 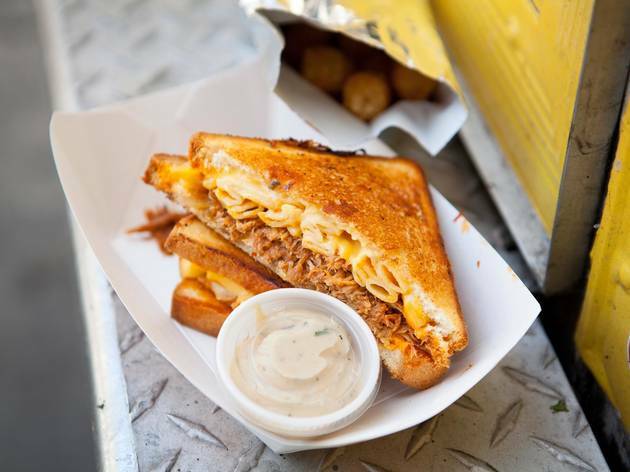 But if you want something heart attack-inducing, go for the cheesy mac & rib: macaroni and cheese, BBQ pork and caramelized onions between two buttery, grilled pieces of toast. Will you feel slightly queasy after eating it? Yeah, maybe. Worth it. This truck was a dream come true when I first moved to Los Angeles. Grilled cheese, hot and gooey, showing up blocks from my doorstep—perfect. The Cheesy Mac (that's mac and cheese sandwiched into your grilled cheese, with optional BBQ pork) is an indulgent and delicious treat. These days, though, I think the truck's gut-busting concoctions are just a bit much to handle (and to pay for).